These photos show the lighting a patient room at the Medical Behavioral Unit at Children’s Hospital of Philadelphia at 6:30 a.m., 11 a.m. and 3 p.m. The Medical Behavioral Unit at Children's Hospital of Philadelphia was an unusual concept from the start. The first of its kind in the nation, it would be a special place for kids with medical problems who also had underlying behavioral conditions such as depression, anxiety, and autism. That called for a special design. Although there's no doubt that this is a hospital, the obvious decorative features of the unit — the subtle but cheery colors, the stylized nature art — are soft and soothing, neither depressing nor overly stimulating. What's not so obvious is the light. It puts CHOP at the forefront of a new trend — circadian lighting — that is picking up steam in health-care settings and, to a lesser degree so far, schools, high-tech workplaces, and warehouses. The idea is to tune indoor lights to mimic the brightness and color spectrum of the sun as it changes during the day. Think bright, bluish light in the morning that gradually grows more amber at dusk and ultimately gets as dark as is possible to get in a medical environment. There's growing evidence that proper light exposure can help keep our circadian rhythms — the body's internal, 24-hour clock — in sync with the sun. That can improve sleep, mood, and metabolic function. It's particularly important in hospitals and nursing facilities, where illness, long exposure to dim artificial light, and frequent wakening at night can cause disrupted sleep and behavior problems. The trend toward circadian lighting is made possible by LED lights, which make it far easier to control color and intensity than fluorescent lights do. Such systems are still more expensive than older lights, but prices are coming down, said representatives of lighting companies. Sagine Simon, nurse manager of the CHOP unit, which opened in January 2017, was excited when she learned the hospital's design experts were interested in trying circadian lighting. "This is an innovative unit, so we thought, 'Why not?'" she said. Douglas Carney, an architect who is senior vice president for real estate, design, construction and facilities at CHOP, was intrigued by the idea that a physical factor could create a more "supportive environment" for patients. Members of his team, he said, like to be the "same kind of thought leaders in our areas of expertise as the clinicians in their areas of expertise." 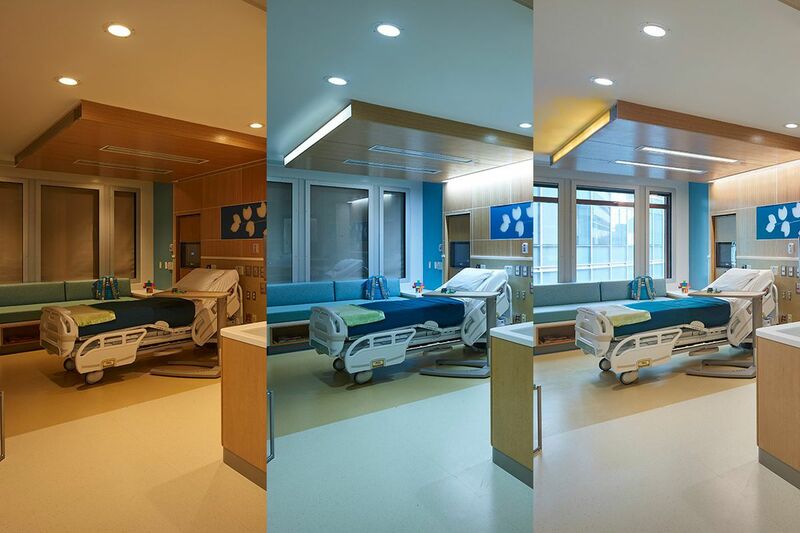 A key proponent of good lighting's health value is Mariana Figueiro, director of the Lighting Research Center at Rensselaer Polytechnic Institute, whose research figured in CHOP's design. She said a well-functioning circadian rhythm is associated with better immune functioning and sleep, plus lower stress. When their circadian systems are out of whack, people are at higher risk for diabetes, obesity, cancer, and mood disorders. Patients hospitalized for more than two or three days can run into trouble because, without proper light exposure, biological clocks shift a few minutes each day. Hospitals and nursing homes typically have too little light during the day and too much at night. General anesthesia, she said, is very disruptive of circadian rhythms. Bright morning light helps "entrain" the circadian system, she said. Her research with nursing home residents with Alzheimer's and other dementias has found that exposure to bright light in the morning improved scores on measures of sleep quality, behavior, and mood. One study that tried circadian lighting with dementia patients living at home found that caregivers also slept better. Figueiro also worked with Mount Sinai Hospital to improve lighting for stem-cell transplant patients. The intervention had "very positive" effects on depression, fatigue, and sleep quality. William Redd, a Mount Sinai psychologist who is involved in that light research, worries that enthusiasm for circadian lighting may have gotten ahead of the science, but is himself enthusiastic. "I personally believe that this has gigantic potential," he said. The stem-cell unit is a good place to test light, he said, because patients are there at least two weeks. Representatives of lighting companies that have worked with health-care facilities — Signify (formerly Philips Lighting), Acuity Brands Lighting Inc., and Ketra, a Lutron company — said interest in circadian lighting has taken off recently, but only a few health organizations have actually installed lights, usually in a pilot program. "People are dipping their toe in the water in a lot of places," said Sandra Stashik, director of strategic specification development for Acuity. It is in discussions with schools about classroom lighting, a university that wants to test circadian lighting in a laboratory, and a company that operates infusion centers. She thinks circadian lighting will eventually become the norm. "It'll just become a natural thing we do," she said. Kate Wickham, vice president of connected indoor lighting systems for Signify, said her company has seen "huge interest" in the last 18 months to two years. Signify, she said, has seven pilot projects with health-care providers. The company is also talking with people who operate office space, warehouses, and hotels. One warehouse project is measuring whether circadian lighting affects productivity, fatigue, and worker error. "I love the fact that it's something that can promote a healing environment that is noninvasive," Wickham said. Tom Hamilton, vice president of solutions and services for Ketra, said his company was involved in providing circadian lighting in common areas of a dementia unit in Florida. Another recent project in a senior facility in Virginia included resident rooms. Lorenzo Albala, a former student at Sidney Kimmel Medical College at Thomas Jefferson University who is now a medical resident, is among a group from Jefferson developing a cheaper alternative to full circadian lighting programs that has attracted start-up funding. It is a night light that comes on slowly when hospital employees enter a patient room at night. Circalux uses a type of light that allows nurses to see but should not disrupt circadian rhythms. The company is still fine-tuning the concept, but Albala said nurses are giving the product high ratings. Mary Alcaraz, an engineer and senior project manager at CHOP, was in charge of creating the Medical Behavioral Unit's lighting. She recently showed off her work in the unit, an area already blessed with natural light from skylights. During the day, hallways, and other common areas were much brighter than typical offices or hospitals. Patient rooms were divided into separate lighting zones for patients, family and staff, especially valuable at night. At night, the light at the nurses' station has more of the red part of the light spectrum, which is stimulating, Alcaraz said, without affecting circadian rhythms. Although the color tone of the light changes, it does not look obviously blue, yellow, or red. What is noticeable is that it is gentler and more pleasant than much office lighting. From left to right, Mary Alcaraz, senior project manager; Stephanie Doupnik, co-medical director; and Sagine Simon, nurse manager, in a common area of the Medical Behavioral Unit at Children’s Hospital of Philadelphia. Citing privacy concerns, CHOP did not allow a reporter to talk to patients or family. But in two rooms that could be observed, the lights were low, a sign that allowing patients to turn down the lights if they choose may work against the potential health benefits of brighter light. Children also can control a light bar over their beds that can change into a rainbow of colors just for fun — a "positive distraction," Alcaraz said. CHOP has not formally studied the impact of lighting changes on patients or staff. But Simon said the lighting seems to improve patient sleep-wake cycles. She finds that walking into the unit "perks you up." Stephanie Doupnik, a pediatrician who is the unit's co-medical director, said she doesn't miss natural sunlight as much as when she worked in other places. Most people seem to like the lights. "I don't think I've ever heard a complaint about the lighting," she said. "I think that's actually a remarkable thing."